Developed for the Process – Designed for You! BioPAT® MFCS enables you to incorporate a new standard in bioprocess data management. Its efficient data acquisition and trend monitoring make it an ideal tool for both R&D and process development. The latest Sartorius BioPAT® MFCS is our most recent development of stable and robust systems to ensure the highest process reliability – all backed by our expertise since 1986. Experience the attractive and modern software design of BioPAT® MFCS. The intuitive workflow facilitates your daily tasks and its amazingly simple navigation allows rapid access to all the process-relevant information. BioPAT® MFCS is compatible with the latest off-the-shelf hardware and software. Quickly collect your data and store it safely in the searchable SQL-database. You will benefit from high performance, scalability and high availability. The Sartorius Service will help you to get the maximum out of your new BioPAT® MFCS. Extensive email support and the possibility to download the most recent version with the latest functionality will ensure reliable operation and easy handling. High quality data collection in a fast, powerful, and searchable SQL-database. Use multi-monitoring access capabilities to boost your productivity. Explore tools and techniques for effective analysis and documentation. Enter off-line process data with the sample data module. Benefit from the self-explanatory navigation for precise operation and total convenience. Compare up to 12 real-time process values in an online configurable trend. Calculate important bioprocess parameters and non-direct measurable variables with the calculation module. Get the right focus for a fast and clear data inspection with the slidable time bar. Quickly switch between up to 24 units and get all relevant information at a glance. Experience the simplicity of efficient and safe system Administration. Get a comprehensive overview and an easy access to all main areas of MFCS. Additional modules for the adaptation of BioPAT® MFCS to your individual process requirements will be available in the near future. Rely on our comprehensive and long-standing experience with computer system validation. BioPAT® MFCS will support all requirements to achieve full compliance with 21 CFR Part 11. With the networking module multiple concurrent users will be able to access current and past batches for evaluation. Enabled by either virtual environments or terminal services, the Network Module significantly reduces IT maintenance and is particularly beneficial for large installations. Future modules for DoE and MVDA enable efficient bioprocess optimization and early fault diagnosis. Moreover, flexible device connectivity based on OPC® improves control of critical process parameters. 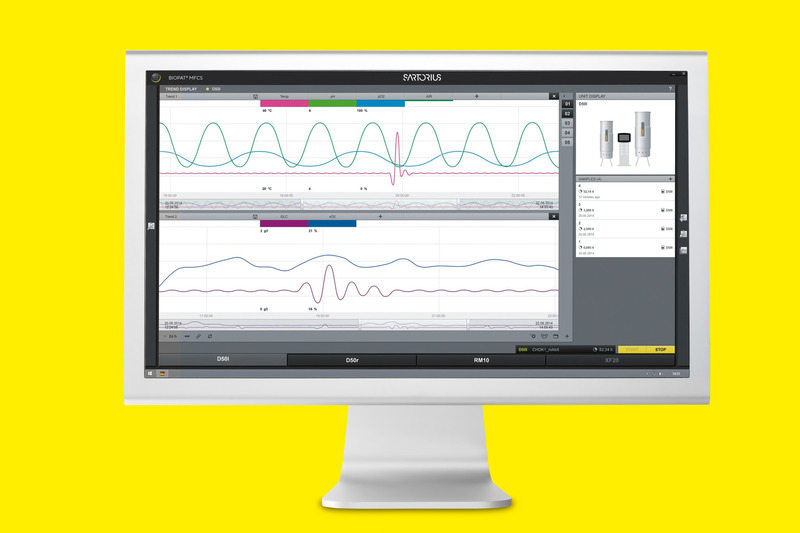 The new BioPAT® MFCS 4 is our most recent software development for reliable data acquisition, effective trend monitoring and supervisory control of all Sartorius BIOSTAT®, Sartoflow®, Certomat® and FlexAct® instruments. In contrast the proven BioPAT® MFCS/win is a feature rich, fully 21CFR-11 compliant software package with preconfigured modules enabling plug-and-play setup of advanced SCADA functionalities. The free BioPAT® MFCS demo works for 90 days after the first installation and cannot be reinstalled on the same computer. BioPAT® MFCS is continuously extended with additional features and improvements to ensure robust process performance and compatibility.